The tunic dress is something that will never go out of fashion. 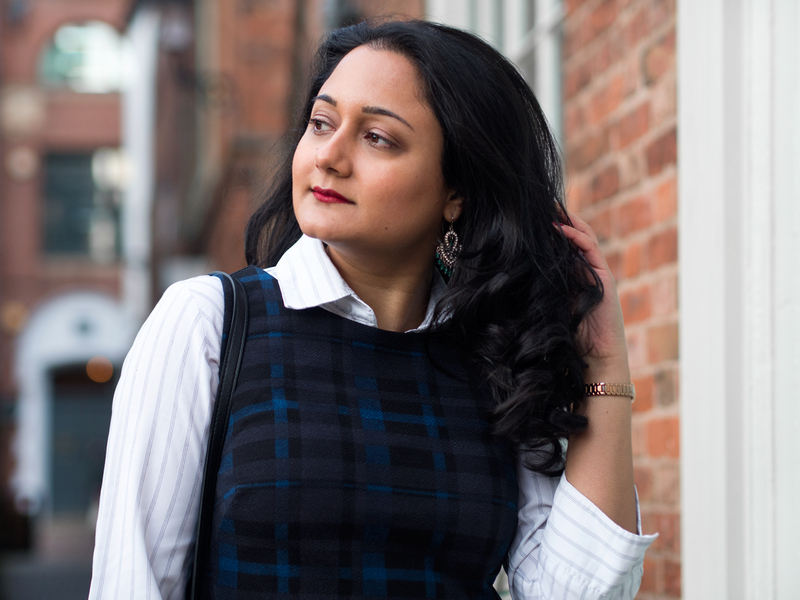 It’s one of my favourite items for smart work wear, but can also be dressed down for a more casual look. 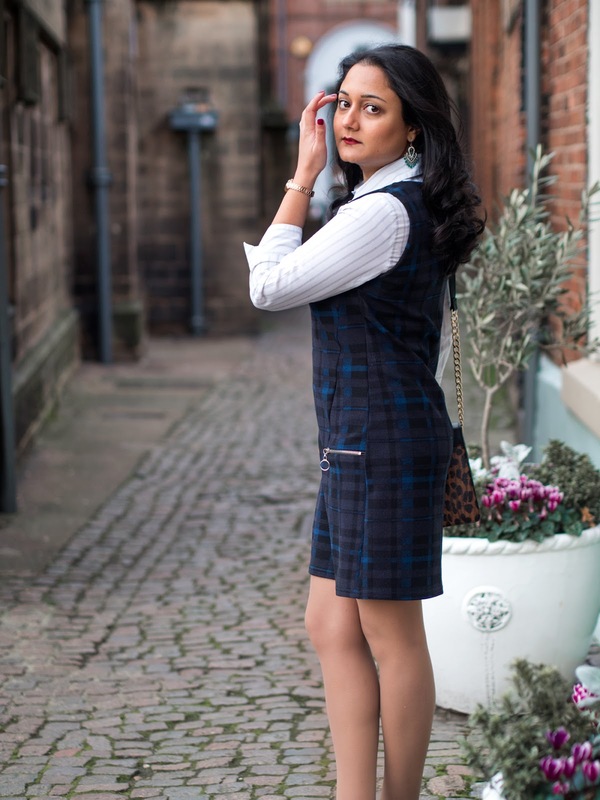 I remember that I used to have to wear a tunic dress in primary school as my school uniform! As an adult, I’m much better at styling a tunic dress than I was back then! Read on for my tips when it comes to styling this piece. With outfits like this, layering makes all the difference. 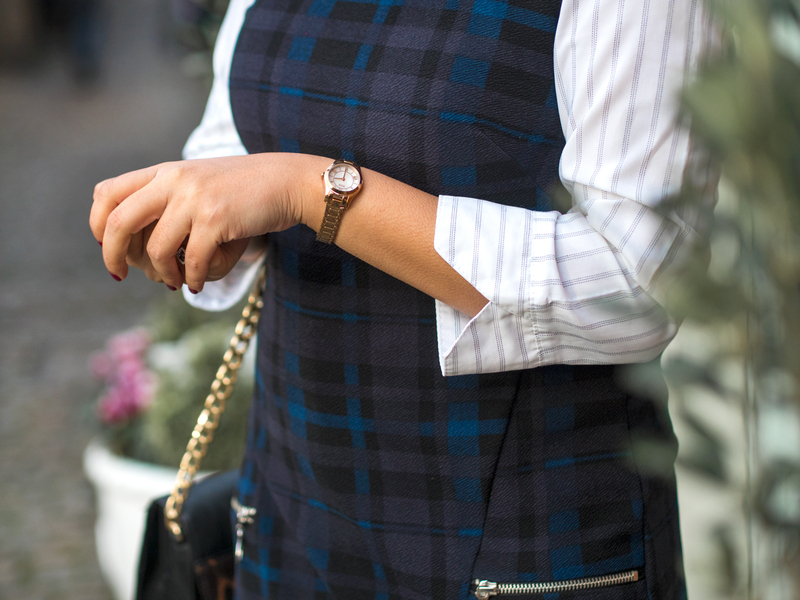 A crisp, long sleeved shirt under your tunic transforms the look into a smart workwear piece. The pinstripes on my white shirt add an extra smart sophistication to the whole look. For a casual look, I would wear a black long sleeved polo neck under this dress. The tunic I’m wearing is a dark colour which perfectly contrasts with the white shirt. This simple touch means that it will always be in fashion and I can wear it any time of the year. The tunic also has a very simple and subtle blue pattern, which can only be seen very close up. If you keep the style simple, you can be sure that it can be paired with most things in your wardrobe. My love for accessories and handbags continues in this outfit with a leopard print bag from Marks & Spencer. As my outfit colours are simple, I felt that a pop of colour with my handbag worked perfectly. This bag is deceptively spacious, with room for all of your essentials including an Olympus Pen camera! I also wore my black shoes from New Look as they are really comfortable to walk in and they look super smart. The cut of the dress falls just above my knee, giving the illusion of long legs when worn with these heels – perfect for a petite lady like me! How do you like to style a tunic dress? Thank you :) One of my friends let me borrow it! Perfect styling! This look will work so well while it's still so cold out. Thank you :) Yes it's a great look for this time of year whilst it's cold outside.